chemistry – Return to Health, P.S. 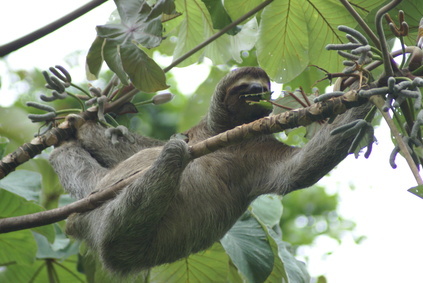 What do Bats and Sloths Have to Do With Osteoarthritis? Just as much as the rest of us do apparently. There’s a myth out there (that I’ve been guilty of perpetuating myself in the past) about the fun idea that bats and sloths don’t show any evidence of osteoarthritis — the kind of degenerative changes in the joints that all vertebrates show evidence of at some point in their lives. It’s not a disease. It’s the natural side effect of being inhabitants of a gravity bound planet. Osteoarthritis is a condition that results from wear and tear. As we move around upright and against the compressive forces of gravity we exert wear on our joints. Wear and tear causes a roughening of the normally smooth surfaces between joints. Rough surfaces moving against each other increase friction. Friction leads to inflammation and given the perfect set of circumstances, inflammation can reach a point that causes pain. In the case of osteoarthritis, the inflammation and pain starts in the joints. So, why are we talking about bats and sloths? The myth that these creatures don’t show wear and tear in the joints despite being vertebrates like the rest of us, comes from the idea that the massive amount of hanging about that they do, eliminates the compressive forces of gravity. While it may decrease it, it probably doesn’t eliminate it, so sorry folks, poor bats and sloths age the same way we do. Maybe the degree of the wear and tear is less extensive for them, but they’re not exempt from gravity. If you grab a random sampling of people walking down the street and x-ray them, you’ll find all of them have some evidence of wear and tear (and thereby “osteoarthritis”) but not all of them have any pain at all, nor will they necessarily. If you have pain and a physician tells you that your problem is because of arthritis (i), what he or she is saying to you is that they really don’t know why you have pain, but it’s not bad enough to be terribly interesting. Having visible evidence of arthritis is not necessarily the reason for your pain. It can be one factor but you should not be satisfied with that diagnosis because all it really translates into is: “joint inflammation”. In this case the joint inflammation happens to be accompanied by the changes seen with osteoarthritis, so naturally we want to point and say: “Look! See?”. If you have pain, it’s because you’re experiencing inflammation that is out of proportion with what your body can usually handle. The body’s systems are constantly working to keep inflammation at bay. When we feel pain it’s because these mechanisms have fallen out of balance. The answer is to search out what it is that fell out of balance; what was the trigger? Only then can you effectively work on restoring balance to eliminate the pain. You will still have evidence of degenerative changes associated with osteoarthritis but that’s not anything special. It’s always good to determine that that’s all there is to see on x-ray, but most of the time it’s a fairly insignificant finding that might not have anything to do with your pain. As much as we would like, it’s just not that simplistic. How quickly our joints wear down and whether or not we experience pain because of it, varies widely based on genetics which determine our chemical resiliency. Chemistry determines the composition of our bones and joints and the environment in our tissues around them. Chemistry is what governs our reaction to inflammatory triggers. Chemistry is the reason the same amount of wear and tear manifests very differently from person to person. There are many different ways to trigger wear and tear stress on our joints living on this planet but the bottom line is inflammation. Learning about your individual triggers and finding your balance is what will get you and keep you out of pain.